Though Jessica Todd Harper uses a camera rather than a paintbrush, the viewer quickly senses in her images the familiar canvases of Sargent, Whistler and Vermeer. 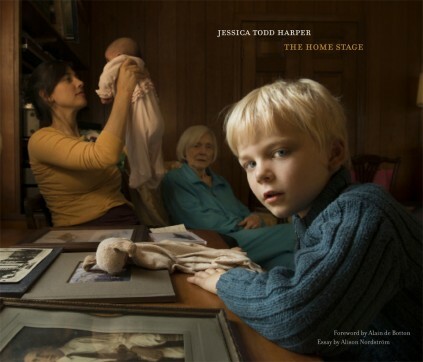 Harper’s naturalistic images pause or recreate real life for the camera; the play between the often-formal environment and her subjects–intimately portrayed family members–creates images that seem at once intimate and artificial. Her latest collection is thus aptly called The Home Stage, a double entendre that references the home-bound lifestyle of families with small children as well as the idea that home is the stage on which children first learn to live. With her elegant compositions, unique color palette and skillful handling of light, Harper transforms every room and yard into a stage set. No detail is left untouched by her eye: even the wallpaper that recedes into darkness bears symbolic significance. Somehow both private and universal, Harper’s photography is genuine, tender, uninhibited and, at times, humorous, demonstrating the emotional range of the finest actor and director and drawing strong performances from her supporting cast–her husband, her children, her sister, extended family and friends. Harper’s photographs have been reviewed in The New Yorker, Photo District News, Camera Austria, the Frankfurter Allgemeine Zeitung and other publications, and she has taught at the International Center of Photography and Swarthmore College. Her first book, Interior Exposure, was published by Damiani to wide acclaim in 2008. She lives in Philadelphia.